Stephen Crabb, the work and pensions secretary, has been urged to conduct a “root and branch” review of universal credit by Labour amid claims the flagship welfare reform has been “salami sliced” to the point that it now represents a financial hit for millions of low-paid workers. The shadow work and pensions secretary, Owen Smith, has written to his opposite number warning that the policy – the brainchild of Iain Duncan Smith, who dramatically resigned from cabinet earlier this month – bears “scant resemblance to its original form”. Smith said its original aim to incentivise people into work had been fatally undermined by George Osborne, who he accused of using the welfare budget as a “cash cow”. Labour pointed to figures from the independent Office of Budget Responsibility, which reveal how the chancellor’s U-turn over controversial cuts to tax credits were not a complete reversal of the policy but a delay, as they were maintained under universal credit. In 2014, universal credit was listed by the OBR as a policy that would cost the government £0.5bn by 2017-18. But after cuts to tax credits were added to the universal credit model, the OBR changed the forecast to say the change would raise £0.5bn for the government that year, because of the reductions in the amounts being paid out. By 2020-21, UC will raise £3.1bn. The OBR said it had “significant ­concerns” about the government’s modelling of universal credit, arguing that it had failed to keep pace with recent policy changes and was not transparent enough. One friend of Duncan Smith admitted that the cuts were not something “he would have chosen to do”. “Ideally we wouldn’t have made any changes to UC,” the friend added, admitting that it would affect the incentive to work. Jonathan Portes, an economist at the National Institute of Economic and Social Research thinktank, said the issue was a point of tension between DWP and the Treasury. 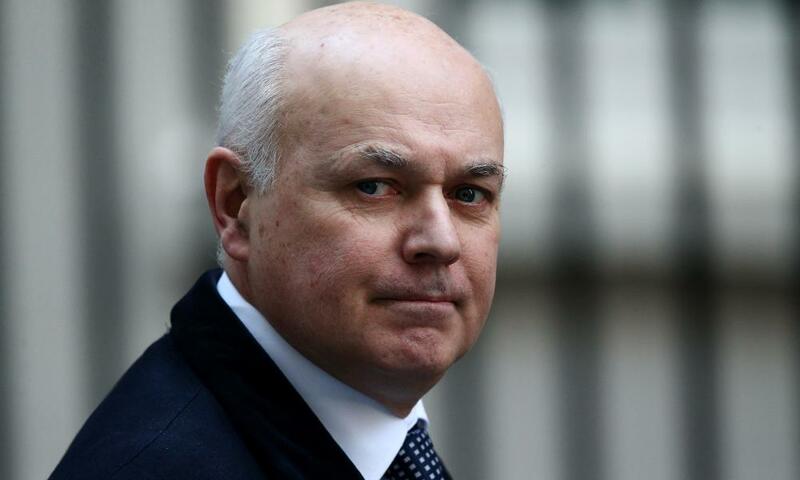 “The deal that Iain Duncan Smith struck with George Osborne was in return for cuts to disability benefit he would get his shiny new toy – universal credit was his shiny toy,” he told the Guardian. David Finch, a senior economic analyst at the Resolution Foundation, agreed and also argued that the transitional protections for those being moved to universal credit appeared very low. The Department for Work and Pensions rejected any suggestion that universal credit warranted a rethink. “Universal credit is revolutionising welfare, with claimants moving into work faster and earning more than under the previous system,” said a spokesman. In his letter Smith also urged Crabb to think again about other controversial areas of DWP policy, including the bedroom tax and cuts to employment and support allowance. “Your appointment offers a chance to review all of these decisions and to correct the mistakes made. I urge you to grasp the opportunity to do so and I reassure you that I will support you wholeheartedly if you do,” Smith wrote. Seema Malhotra, shadow chief secretary to the Treasury, said the OBR report showed British families were facing “unprecedented levels of debt” – with household debt forecast to hit £65.5bn by the end of the parliament, up from £49.5bn predicted four months ago.